Speeding up the recorded movements digitally underlines the individual characteristics of the repetitive rhythmic actions. Pattern 58 of evolutionary run 20_frog. Pattern 71 of evolutionary run 20_frog. Pattern 124 of evolutionary run 20_frog. Pattern 186 of evolutionary run 20_frog. Selection of patterns with the highest performance values over the course of the evolutionary run 19_frog. Each pattern's fitness results are listed in consecutive order. Several evolutionary runs have been conducted on two different robotic creatures. By focusing the evolutionary computation on only a few springs clear results were achieved. Then the evolution was able to successfully discover the springs' individual dynamics and modify the actuation patterns accordingly. A steady rising fitness value during the ongoing evolution. The fluctuations in hardware dynamics and environmental conditions that were meant to supply the unstable fitness landscape were mainly caused by defective electronic connections. Several springs tended to become inactive during long 24-hour-runs. This instability was not intended yet served as good steering material for the evolutionary computation. If the fitness weight values of the evaluation function were set accordingly, the evolution was able to detect which springs were inactive and to compensate for these errors. The evolution copes with the loss of springs by reducing their heating time to prevent waste of energy. The two-dimensional perception of the monitoring video camera and a mere focus on simple motion detection doesn't allow identification of individual joint movements. The overall motion of the whole creature is summed together and this makes it impossible to distinguish if the resulting motion originates from active or passive relocation. The more springs were employed the more complex the cause-and-action relationship of activation and movement became and the less obvious trends could be recognized in pattern design. This missing talent of coping with higher complexity can maybe be explained with the too small population size, the too high mutation rates and the too short evolutionary runs. By taking the human designer out of the loop, the artwork shows the shift from human constraints to machine constraints. The pure information about the robot's movements is filtered and distorted by the eye of the camera. This imperfection leads to behaviors that can be perceived as cheating, when the evolution presents solutions that might satisfy the program's fitness evaluation yet not the human inspector. Here the system reaches a certain degree of autonomy from the human intentions that guided the design of the evolutionary framework. Departing from its foreseen path the system escapes into its own world of logic. The two-dimensional view of the camera excluded for example movements that acted in parallel direction with the viewing angle of the lens. This made the evolution disregard the importance of certain joint movements. If the influence of the energy usage was high enough in the fitness evaluation, the evolution was partially able to discover this waste of energy. By perceiving the particular spring elements as less influental in the motion production or even inactiv, the system reacted by reducing the specific spring heating times as described before. Yet this effect was only possible if the number of active springs were kept low. Even though most evolutions didn't necessarily produce highly representable results in terms of evolutionary strategies, they still succeeded in creating different rhythmic motion behaviors. 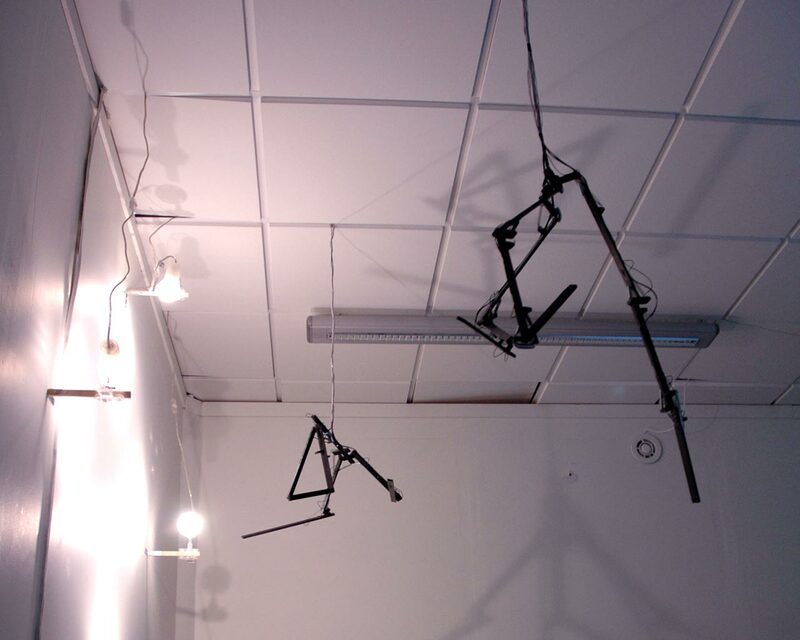 In the real-time exhibition setup the movements of the robotic creatures emphasize more the slowness and noiselessness of the SMA springs, whereas speeding up the recorded movements digitally underlines the individual characteristics of the repetitive rhythmic actions. Displaying cycle times of 60 seconds as a 3 seconds loop, transforms the former abstract limb actuations into associative flapping, hopping or walking behaviors. The time lapse videos allow to recognize the fine distinctions between the individual patterns much better and create much higher mimesis effects in the mind of the viewer. The creatures suddenly become animals performing locomotion techniques in free air and draw associative character traits like jerkiness or jumpiness.